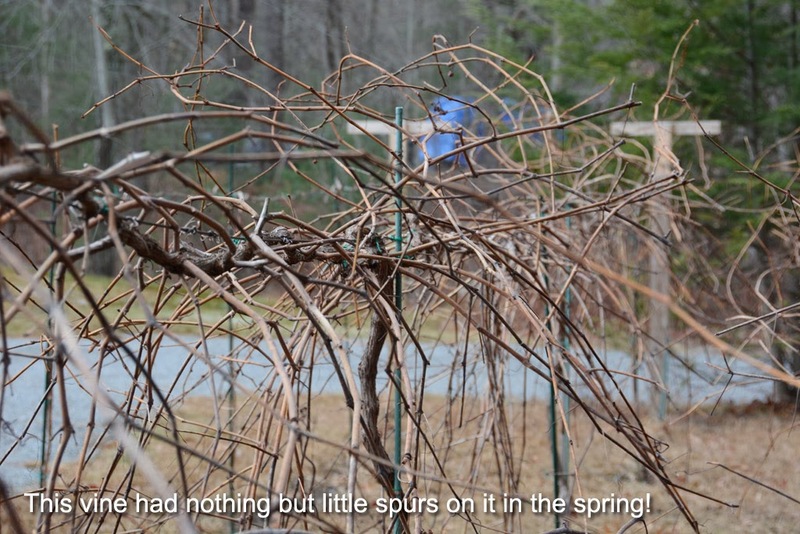 When the vines lose their leaves in the fall and turn into rather whispy-looking collections of twigs, it's time to start pruning. 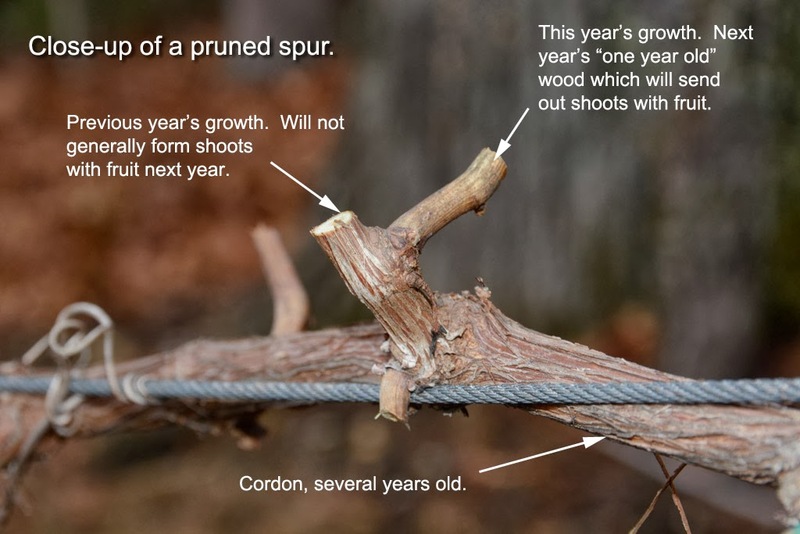 Pruning is an essential part of growing grapes because without correctly pruning the vines, you will not be able to control the fruit production. Because fruit only forms on shoots from one year old wood, there is a very specific way of pruning vines to be sure that the right amount of fruit is made in the spring when the vines flower. 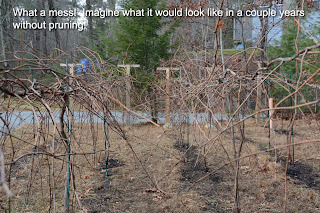 Without pruning, you would get a lot of leaves and not much fruit, or sometimes a lot of leaves and way too much fruit (which the vine might not be able to ripen) as well as fruit being formed all over the place...on the ground, etc. where it couldn't ripen or would be eaten by critters. 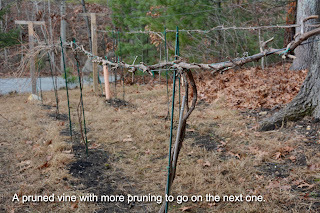 Pruning might not sound all that exciting, and perhaps it's not, but I really enjoy it. First of all, it gets me outside on a nice winter day. 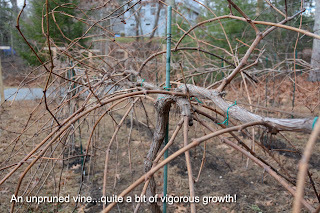 It let's me spend some time with the vines really seeing what they did in the summer, without all the leaves in the way. I go slowly, taking my time, readjusting all the ties on the trellis as I go. 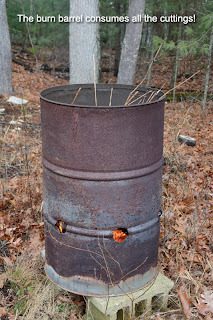 I like to fire up my "burn barrel" and get a good fire going in there to burn the cuttings as I go. This is a technique I picked up in Burgundy. It has multiple purposes. 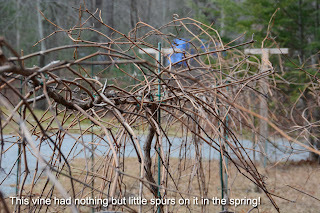 First, it gets rid of all those cuttings, and believe me there are a lot of them. Also, by burning the cuttings, we remove a potential source of year-to-year disease/fungus/pests from the vineyard. 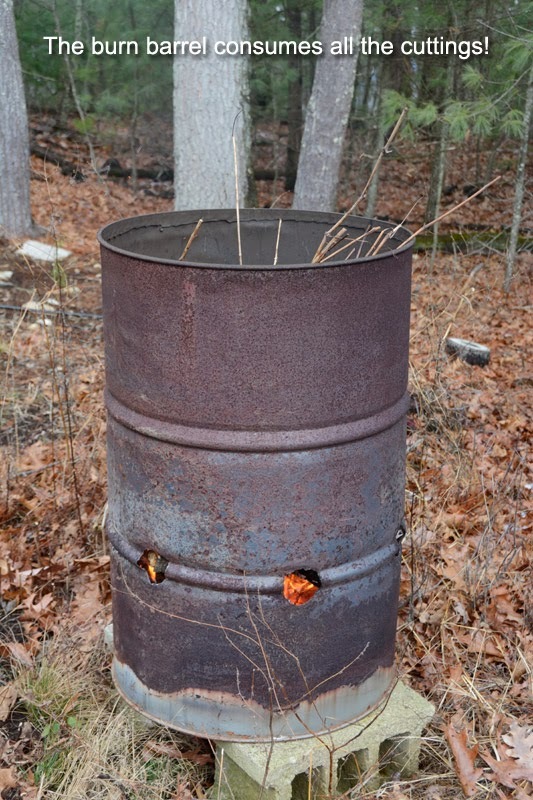 Finally, the ash can be sprinkled on the vineyard, bringing those nutrients back into the soil. And hey, the fire keeps me warm! 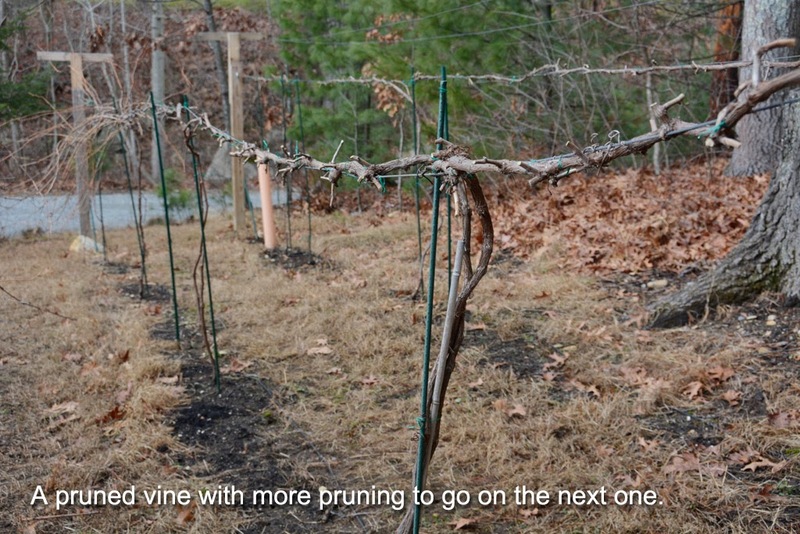 The difference between the starting and finishing look of a pruned row is pretty impressive. It looks like I have killed the vine, but trust me, in spring these things will explode into life and fruit production!